Veritas and Stanley with walnut knobs & handles/totes I made. My name is Bill Rittner and for most of my life I have been a tinker and a lover of fine tools. I was born in New Britain, Connecticut USA back in the late 1940’s and most of my small family worked for Stanley Tools. Being exposed to tools at an early age led me to learn to appreciate them and to use them. I was always building something. My grandfather was the superintendent of a division of stanley that was called the farm. This division purchased all of the rough lumber and made all of the tool handles. Most tools still had wood handles. My father served his pattern making apprenticeship at Stanley and worked in the pattern shop for 20 years. Though there was a strong family influence towards woodworking I chose to go into the metalworking trades after high school. After graduation I entered the machine apprentice program at Pratt & Whitney Aircraft in East Hartford, Connecticut. After that program I entered the tool making apprenticeship of a large,local manufacturer of jet engine fuel systems. I spent my working life in the metal trades and still work part time running the inspection department at a small local machine shop. Woodworking must have been in my blood. Sometime in the 1970’s I became interested in furniture and for the next 15 or so years I studied all I could find about furniture and even dabbled with making some crude pieces. At the end of the 1980’s along came Norm Abram and I was hooked. Almost immediately I began putting together the typical power tool shop on a very low budget. In the 1990’s I became interested in antiques and especially antique and vintage tools and began to deal and collect them. In dealing and collecting the antique and vintage tools I learned to sharpen them and to use them so I could be an informed dealer. However, for the next 10 years or so, believe it or not, the two endeavors remained separate. I had really been indoctrinated into power tool woodworking. 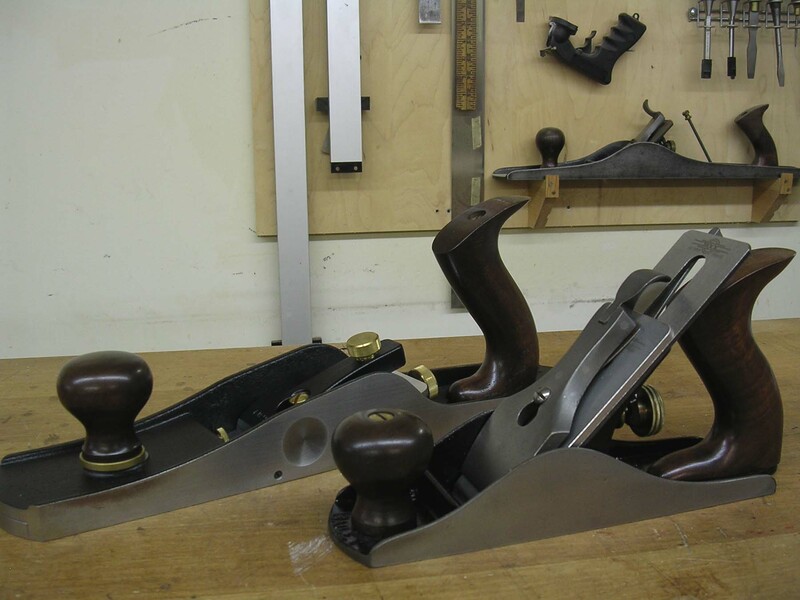 At some point I had a real Aha moment and realized that quality handtools belonged in the modern woodshop. At that point I went from being a dealer/collector to a handtool woodworker. Now I’m not a handtool only woodworker. I still have and regularly use my stationary power tools, but I almost never use my portable power tools. In looking back over the last decade I can’t imagine building furniture without good well fettled handtools. Now I’m taking my handtool dealing and love of quality tools into the twenty first century. I hope you like my offerings. Love your blog. So helpful, so interesting. Thank you for taking time!